At this point in the Democratic race, Bernie Sanders is making good on a promise: He's more than a long-shot for the Democratic nomination, but he has vowed to stay in the race until the very end. Although he seems well aware that the odds are clearly not in his favor, the underdog candidate revealed his latest campaign strategy on Saturday. It's a two-pronged approach that involves a Sanders win in California and a contested convention. At a news conference on Saturday, Sanders told reporters that he planned to go after superdelegates in order to give his campaign a chance at the convention, according to CNN. 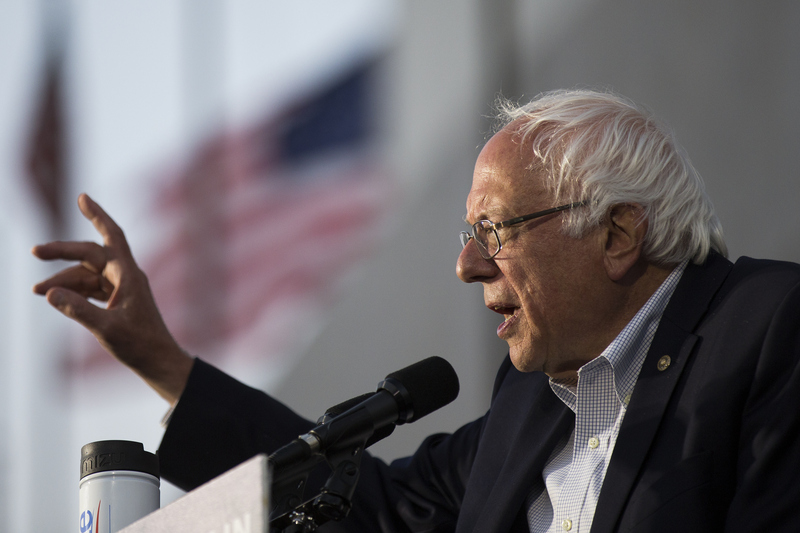 "The Democratic National Convention will be a contested convention," said Sanders. We understand that we have a steep climb...I'm not here to tell you that tomorrow we're going to flip 300 superdelegates. You don't hear me say that. But I am saying we are going to make the case. By the count of The New York Times, Sanders had just over 1,500 pledged delegates on Sunday, while Clinton had more than 1,700. Meanwhile, Sanders had just 46 superdelegates, while Clinton had 544. Even if Sanders could flip 300 superdelegates before the start of the convention, he likely wouldn't have enough delegates to reach the 2,383 needed to win the nomination, nor would he necessarily have enough to keep Clinton from clinching the nomination herself. For that to happen, Sanders will need to win more pledged delegates, which he could do in California. California voters will head to the polls on Tuesday, along with voters in Montana, New Jersey, New Mexico, and the Dakotas. For her part, Clinton is largely expected to clinch the Democratic nomination with a win in New Jersey, before the polls on the west coast even close. But that's if you count superdelegates — Sanders hopes that you won't. "Hillary Clinton will not have the requisite number of pledged delegates to win the Democratic nomination at the end of the nominating process on June 14," said Sanders. California's hundreds of pledged Democratic delegates make it an important, although late, showdown between Sanders and Clinton. Polls show that Clinton just barely leads Sanders heading into Tuesday's vote, but a recent surge in voter registration shows that Californians are energized about the election and could turn out in an unpredictable fashion. A few short months ago, it was Republicans who spoke about a contested convention. Now, it's Sanders, hoping to give his campaign some last-ditch momentum with a win in California on Tuesday. Even if he doesn't win, he could at least stop Clinton from earning the number of pledged delegates needed to win the nomination. If he does that, he can focus on superdelegates, the part of the process that he has long protested, as a way to engineer a contested convention.